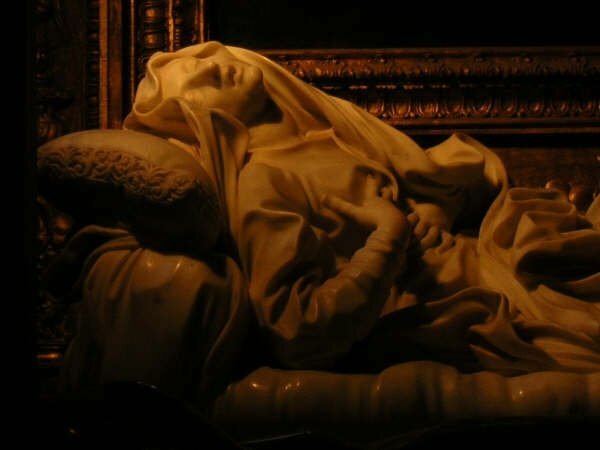 Bernini’s Bl. Ludovica Albertoni menaces us by putting her best Baroque forward. What I love the best about the passage I’m going to quote at length below is how it goes against so many trendy opinions. It should royally tick off the following groups: Baroque haters, techie nerds, entrepreneurs, Trent detractors, modernity boosting Neo-Cons, liberals who still believe in progress, detractors of modernity, some Protestants, Duns Scotus slanderers, and believers who lose their lid whenever they’re preached at by an atheist. “. . . During the same period, in response to the Protestant Reformation and the humanist breakthrough, Baroque art following the Council of Trent breathes new life into the Catholic experience through the fabulous proliferation of music, painting, literature. Without denying the suffering, nor leaving out the silence, new languages sublimate plaintiveness, turning it into a kind of serenity ready to bloom with joy. Doesn’t Ecce homo here arrive at total lucidity in a new ecceistas, that is, in a singularity already foretold by Duns Scotus, but one that is henceforth none other than the singular freedom of creation of European men and women, living though misfortune and wretchedness and initiating a new, a modern universality? Let–I invite you as my final argument–let the ‘miserere nobis’ of Mozart’s Mass in C Minor resonate in your mind. ‘Miserere nobis,’ sings the choir, and pain is here refined into complicity, into grace, into glory. This civilization–from the Christ who inhabits this altar [in Notre Dame de Paris] to Mozart whose renown is worldwide–this civilization, ours, today menaced from from the outside and by our own inability to interpret and renew it, bequeaths us this its subtle triumph over human suffering, transformed, without losing sight of the suffering to death of the divine itself. It is incumbent on us to take up this heritage once again, to give it meaning, and to develop it in the face of the current explosion of the death drive.